Despite the fact that the entrance corridor of the 13th edition of Frieze Art Fair had a sign that said “Welcome to Purgatory” (by artist Lutz Bacher) it’s safe to say that a few of this year’s exhibitors were in heaven after closing a number of five to six-figure deals throughout the week. The bulk of these hefty transactions took place at more established galleries and general profits at the fair were mixed. Buying trends favored well-known artists over emerging ones. While financially wary collectors were not taking a chance on new artists they did buy predominantly new works. Chris Ofili’s 2015 piece, Midnight Cocktail went for $750,000 and Damien Hirst’s 2015 painting Holbein (Artist’s Watercolors) fetched $1.2 million. Unsurprisingly, Damien Hirst was a top seller at the fair and White Cube Gallery sold two new bodies of work by Hirst aside from Holbein. 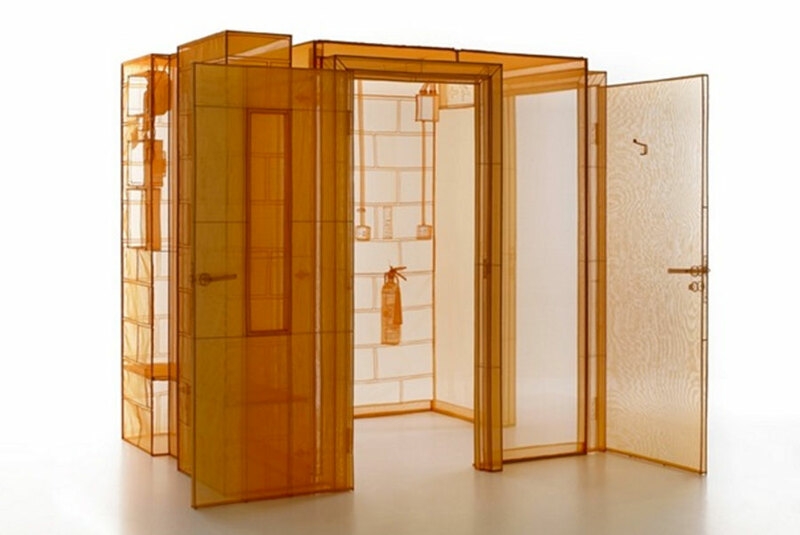 Four of textile artist, Do Ho Suh’s, recent pieces were bought. The most exciting being a 2015 polyester and steel rod sculpture titled Hub, London Studio, which went for around $450,000. Female artists generated some of the highest sales. Leading contemporary art gallery, Sprüth Magers sold two Jenny Holzer pieces. 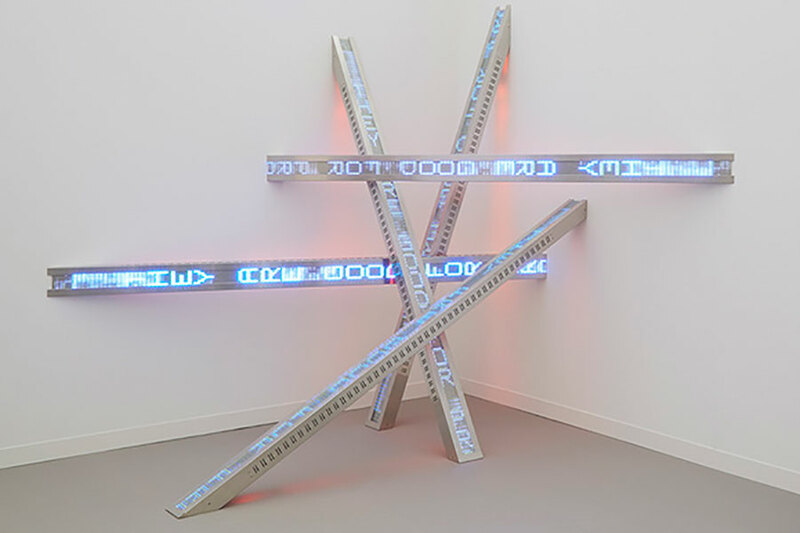 All Fall (2012), an LED sign sculpture went to an American collector for $500,000 while Holzer’s redaction painting, TOP SECRET NOFORN 11 (2011) sold for $250,000. Lehman Maupin sold six works by star British artist Tracey Emin in the range of $20,000 to $350,000 and a pair of panels by African American artist Mickalene Thomas for $125,000 and $175,000. 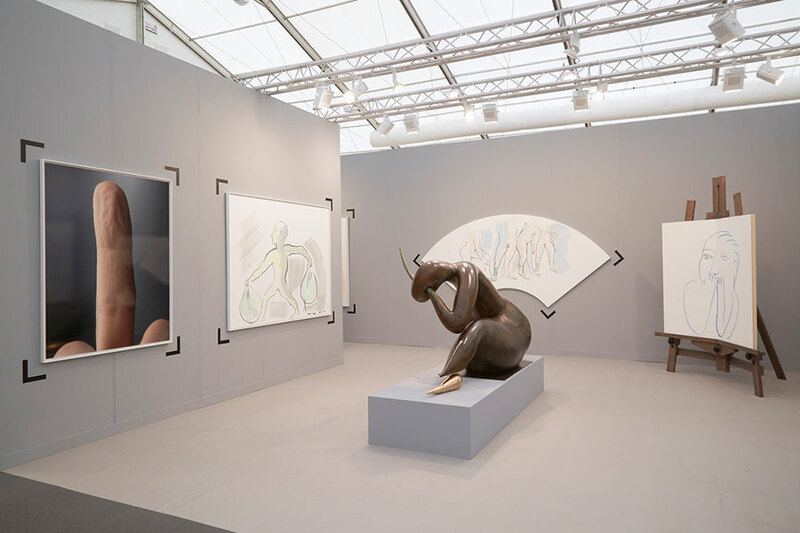 Sculptor Camille Henrot’s show sold out at kamel mennour’s booth. All eight editions of her central sculpture, Retreat From Investment, were placed for around $230,000 each. Attendance was better than ever at Frieze and at newer fair, Frieze Masters. Masters reported a 260% increase on opening day, possibly due to patrons heading there first to avoid the heavy crowds at Frieze. Notable trends at the thirteenth fair included cartoonish paintings and sculpture (including Mark Leckey’s Inflatable Felix, which sold for $75,000), large Installations, and glazed ceramics. Sales figures courtesy of Artsy and Artnet.